ThingLink has added a new feature to encourage collaboration and conversations about images. It’s called REMIX. 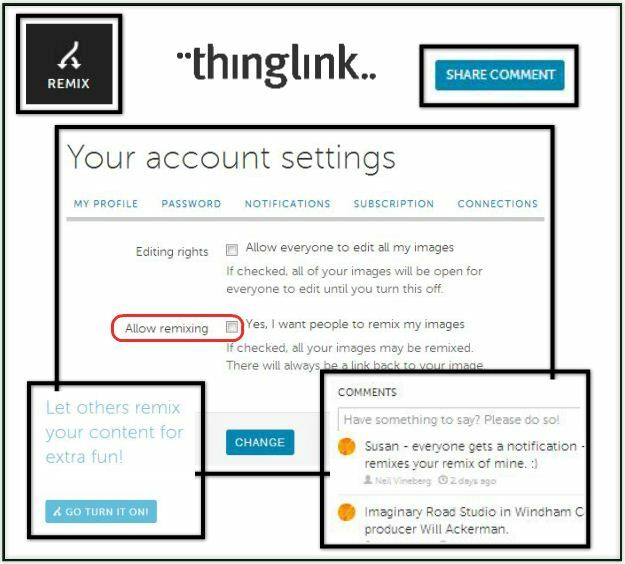 If you are already using ThingLink you will need to turn REMIX on. Look for the option when you click on My Channel. New users will find this feature to be automatically enabled. You can REMIX someone else’s image by going to ThingLink.com, selecting an image, and clicking on the REMIX icon to create your own version of the image in your account. Once the image is in your account you can add tags. The tags will appear on your REMIXed image, but they will only appear as Comments on the original image. The comments will have a link to your REMIXED version. Here is an example of an image I REMIXED. Click the image to view the conversation. Teachers can post an image with discussion questions for students to REMIX and answer. Students can create an interactive image to demonstrate knowledge and ideas. As part of the sharing process, students can REMIX and add comments and responses to the ideas presented. An interactive image can be used to present a real world problem to students. They can REMIX the image with possible solutions to the problem. Try REMIX to launch learning experiences that engage students in a range of collaborative discussions to build on the ideas of others and express their own ideas clearly. This is one of the skills identified by the Common Core. Here is a well done and nicely paced podcast by Jeff Herb to explain using the Apple TV in the Classroom. The podcast is published on Education & Technology’s Instructional Tech Talk and I recommend listening to it if you are fortunate enough to have an Apple TV for use. Teachers who regularly blog are creating chronological and searchable records of their own growth and development. This is a good reason for teachers to blog. A blog is a journal that is filled with ideas, your ideas. It is flexible, visual and user friendly. A blog can be a tool for self-reflection. One who blogs as part of the regular workflow must dig deeper in order to explain. Since March of 2009 this Cool Tools Blog has been my primary tool for teaching and learning, which means I have blogging for four years. One example of my own learning and growth can be found by taking a closer look at the tool I chose to introduce in my first post, Wordle. Explore this interactive image to see how I adapted and fine tuned my use of this one tool to meet some teaching challenges and needs over the course of the past four years. Find all of these examples on this blog, of course. To keep a journal of your professional growth. For something to strive for. The best blog posts are those that reflect on successful experiences. To document and share the great things you’re doing in the classroom through vivid samples and snippets of what’s going on. To teach students about digital citizenship and web etiquette as you engage them in discussion about what’s going on in the classroom. Who Should You Blog For? Blog for yourself. Blog about the learning that occurs inside and outside of your classroom. Blog about ideas. Blog to document the great things you are doing. If you decide an audience might benefit from reading your blog, promote your blog to that audience. Just start blogging. There are many free and user friendly platforms to suit a variety of blogging needs. Check out Blogger, EduBlogs, WordPress and KidBlog to see which tool works best for you. If you are interested in joining an online community of bloggers, check out the EduBlogs Teacher Challenge, a self-paced learning adventure that’s sure to keep you engaged. With the end of the school year in plain sight, this Spring just might be the perfect time to try blogging. If you don’t like it, you can end your blogging career with the end of the school year. If you do like it, you might appreciate having time to explore and fine tune your blogging skills during the summer. As a teacher and life-long learner, I take a lot of notes. One of the best changes for me has been taking notes on my iPad because now I often find myself having fun trying to create attractive and useful notes. The note-taking process keeps me amused during meetings and the task keeps me challenged and attentive as I try to draw and explain the ideas being shared. 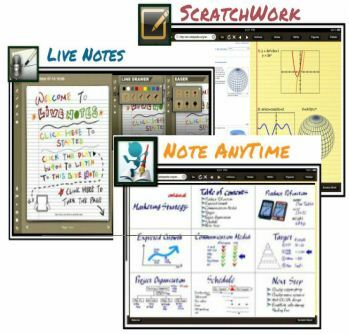 Here are 3 engaging apps to try to help put a little fun back into note-taking sessions. 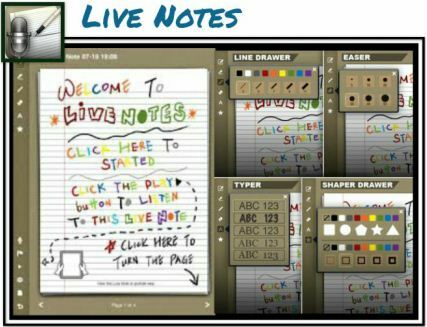 Live Notes is a colorful note-taking and sketching app that allows for simultaneous audio recording. Draw shapes and doodles during a lecture or meeting. Type text and choose from a variety of fonts and bright colors. Tap parts of a sketch to hear the audio that was recorded at the specific point in time when the sketch was drawn. Live Notes is a paid app, but you can try Live Notes Lite for free. 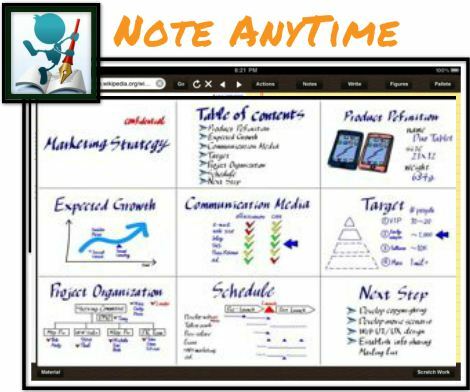 Note Anytime is an app for taking notes, sketching, and annotating PDFs. 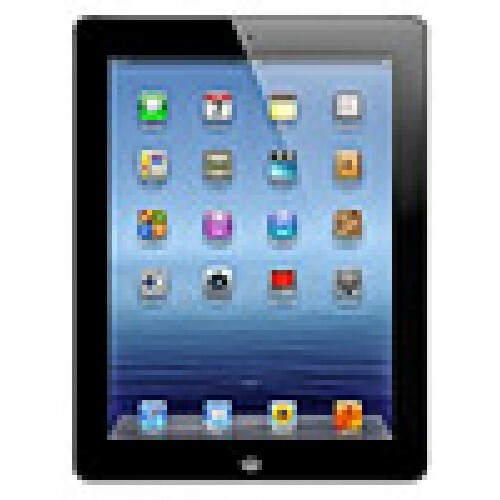 Caligraphy tools support improved letter formation providing assistance with sloppy iPad penmanship. Use the app to easily import and markup PDFs. Export notes to popular social media sharing sites, like Twitter, Facebook and Drop Box. Note Anytime is currently a free app available in iTunes. 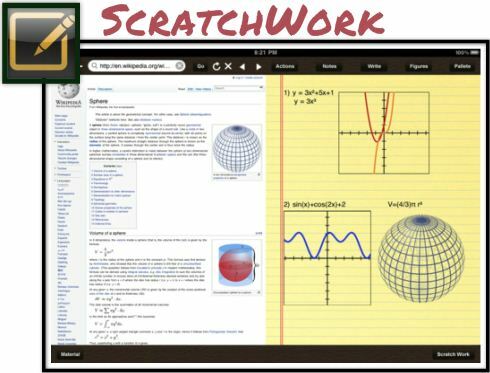 ScratchWorks is a note-taking app that allows users to take notes on one side of the screen and browse the web on the other. Type text notes or insert a sketch area into the notes for doodling. It also provides a custom math keyboard. ScratchWorks is a free app, available in iTunes. Here is a great opportunity for teachers and students to have fun and try something new. The ThingLink Interactive Image Contest invites students to connect audio, video, images, and text in one cohesive presentation. Students will dig deeper into content through research to present knowledge and ideas as they learn, practice and demonstrate digital literacy skills in image creation, selection, content curation, creativity, tagging and sharing. The best advice I can suggest to get started is to create something totally within your realm of expertise This will allow you to experience how easy it is to create something useful with the tool. The best example of this was submitted by a webinar participant. I can’t find the original, so I created something similar. Once you see how easy it is to use the tool you can get as complex as you wish to design amazing and powerful learning experiences. We got quite a bit of snow in Chicago over the past 24 hours. This interactive graphic is an example of engaging students in Common Core driven learning experiences that are relevant. If you haven’t visited the ThingLink Toolkit I created, you might be please to find a wealth of resources and project samples for using ThingLink for teaching and learning. There are several activities that weave the Common Core into the learning opportunities and the ideas are designed to get you thinking and exploring. Until now, the best tool I’ve shared has been Using Google Docs Self-Grading Quiz as an Exit Ticket. This post has claimed the position of runner up in popularity of posts on this blog because many teachers recognize the need for quick and efficient ways to collect and use data to maximize and fine-tune instruction. Flubaroo is easy to set up, it’s reliable and it’s far more efficient than the manual method I used to use and support. Flubaroo is a free script you can easily add to the Google Docs Form to help you quickly grade multiple-choice or fill-in-blank assignments. Just follow the steps in the user’s guide to install Flubaroo and you will get access to a Flubaroo menu. This menu replaces the need to add functions manually to columns in a spreadsheet and it automates email results. Flubaroo was designed by an awesome teacher. There is a complete, illustrated walk through to help users get up and running with the tool in a matter of minutes. It is very well done! Visit the Flubaroo website and follow the steps in the user’s guide. Flubaroo will email results to students. For students without email you can easily publish the GoogleDocs Spreadsheet results and take advantage of student codes or pen names in place of actual names to protect student identities. Quickly gauge student understanding and adjust instruction to provide for the reteaching, support and challenge indicated by the results of the quiz. Use the time you saved not grading to fine tune your instruction. If you haven’t used a Google Docs Form with students yet, this experience might open the doors to a variety of additional uses for collecting information from students via an exit ticket to provide students with opportunities to voice their opinions, express concerns, reflect and collaborate in the 24/7 classroom. Today I get to collaborate with my peers to explore and share iPad apps for teachers. With so many apps, so little time, and so many contributors, the decision about which apps to share could get complicated so I tried not to over-think it. Here are some apps I’ve chosen to share. Watch this list grow as I add the ideas of others to my playlist!